To reduce spammers from sending e-mail that appears to come from your domain (known as e-mail spoofing) you can publish an SPF record to your domain name's DNS records. An SPF record tells receiving mail servers which servers are explicitly allowed to send e-mail that comes from your domain name. It is strongly recommended you publish an SPF record to prevent e-mail spoofing. You can use the SPF Record Analyser to validate your record applies the rules you expect. If you wish to test a live SPF record, enter the domain name the SPF record belongs to in the "Domain name to check" field. If you wish to test a record before publishing it, enter the content of the record in the "SPF record text" field. Whichever option you have chosen, the results will be the same. The actual SPF record analysed will be displayed, followed by a breakdown of the servers that are present in the SPF record, and an indication of whether they are authorised to send e-mails on behalf of the domain. The example below shows the analysis of the SPF record for simplyremind.me. 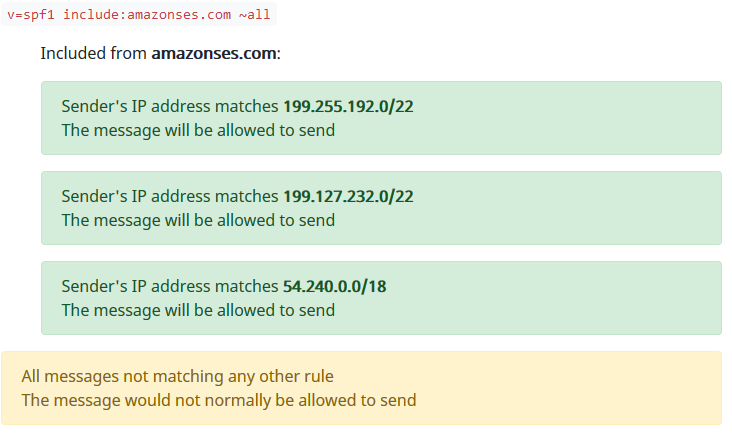 This record imports the SPF rules from the amazonses.com domain, which in turn allows the following IP addresses to send e-mails addressed from @simplyremind.me: 199.255.192.0/22, 199.127.232.0/22 and 54.240.0.0/18.